Grease two 7 inch cake tins with oil and set aside. Sift together the plain flour, corn flour, baking powder, baking soda and salt. Combine the milk, vanilla, sugar, lemon juice and oil in mixing bowl and beat until the sugar dissolves. Add the sifted flour in 2 – 3 batches and gently fold the mixture until the batter shows no trace of flour. Don’t overmix or overbeat. Don’t let the batter sit out too long. Divide the batter evenly between the two cake tins and bake at 180 degree C for 30 – 35 minutes or till a toothpick inserted in the middle of the cake comes out clean. Allow the cake to cool for about 15 minutes and then invert. Let them cool completely for a few hours. Add the vanilla essence and salt and combine. Add the powdered sugar and beat very well. Add the milk one tablespoon at a time until the frosting reaches the preferable consistency. Beat the frosting until it is light and fluffy. 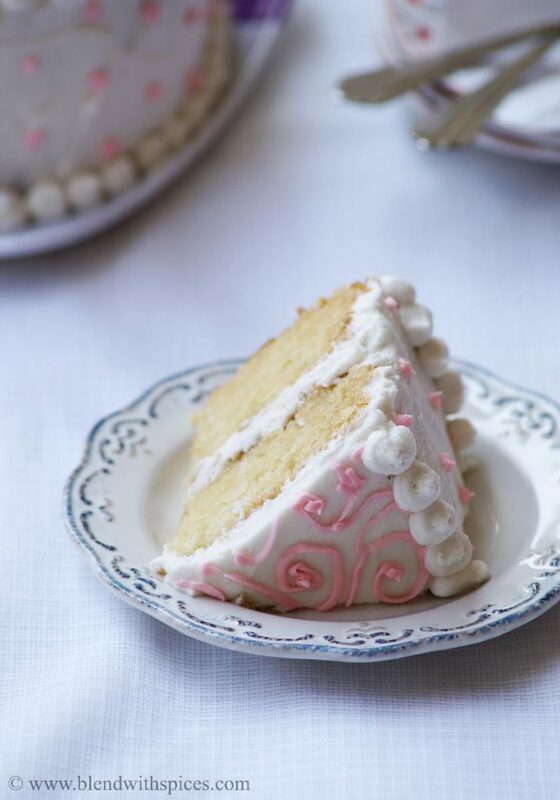 Place the cake on a plate or cake board. 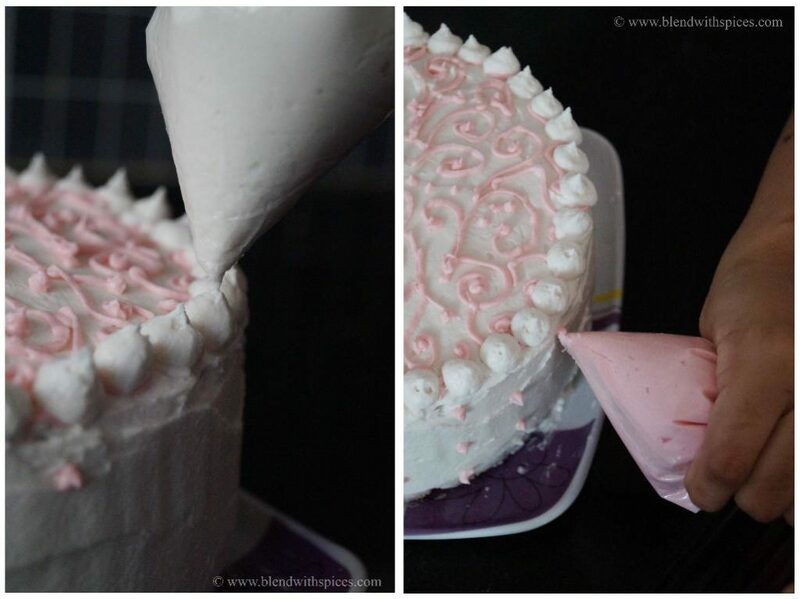 Spread the prepared frosting evenly on the cake. evenly until the cake is covered with a thin layer of frosting. Keep the cake in the refrigerator for 30 minutes for the crumb coat to set. After 30 minutes, remove the crumb coated cake from the fridge. 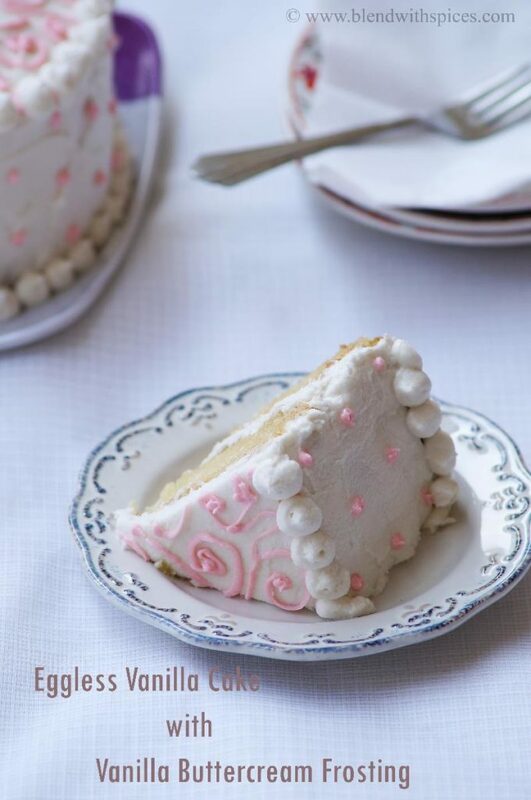 Spread a thick layer of frosting on the top and sides of the cake. 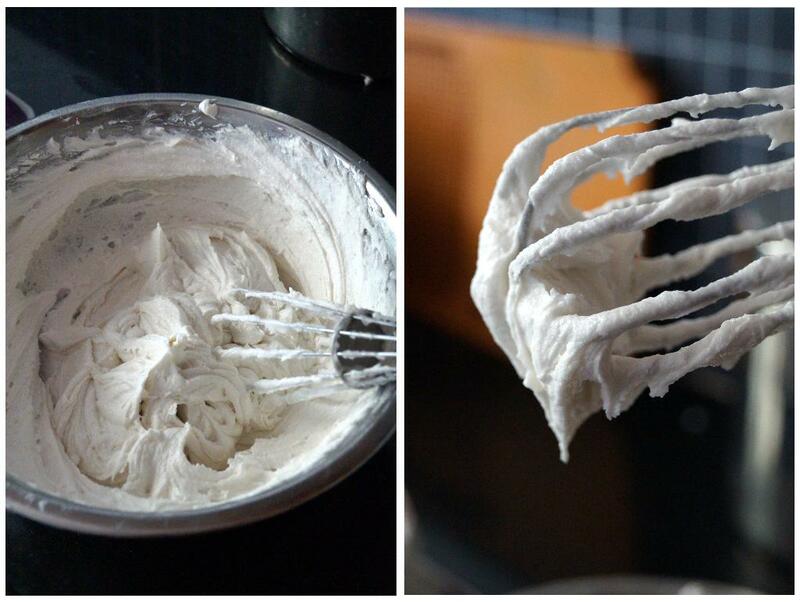 Spread it with a spatula until even and smooth. Divide the remaining frosting and add food coloring and mix. Fill the piping bag / ziplock bag with the frosting cream. Pipe a decorative border around the top and bottom edges of the cake. 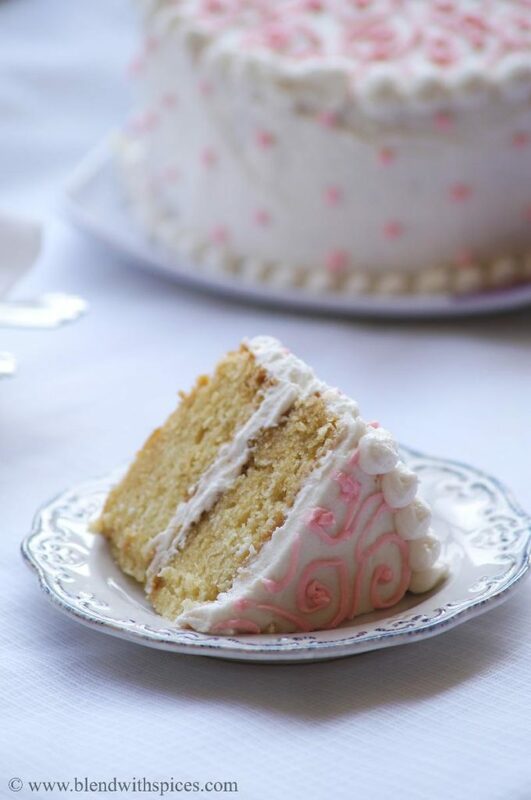 Let the frosted cake sit at room temperature for about 20 minutes before serving. cake looks so yumm and delish. Perfectly done deco..love the colours..
Love the little bit of corn flour in there! I have some that I'm trying to use up. Very cute and attractive cake, lovely decoration. 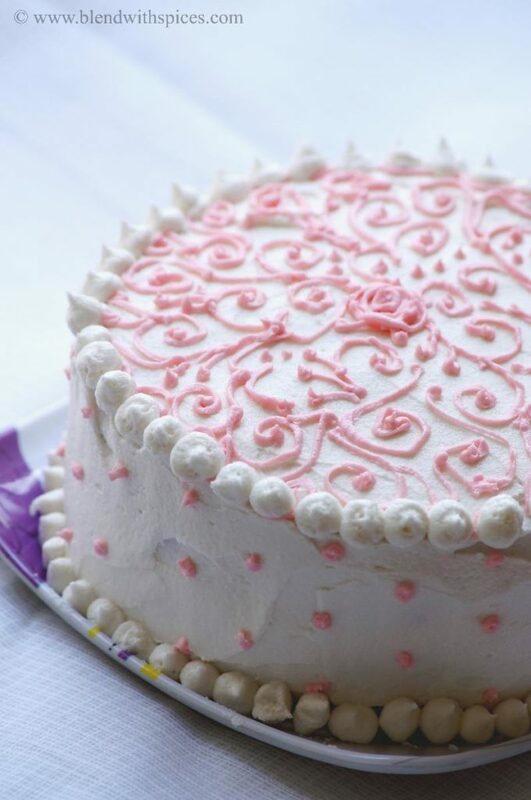 Looks good with pink frosting! Lovely cake, very beautifully decorated, yumm.. Thanks for the recipient. Cake came out very good. I could offer to Lord Krishna on a festival today. Looks super yummy n delicious. Could I substitute the oil with butter? Would the measurement be same or needs alteration? Pls advise. Hi is the milk powdered milk or in liquid form? The worrying part is, the frosting looks like the milk has spoilt in it o_O please suggest. I am sorry for that.. I am not sure where went wrong. Add milk little by little to the frosting till you get the right consistency. or add more powdered sugar to adjust the consistency. Sorry for the late response.